FLAG STOP’s mission is to present new and emerging contemporary art to a larger audience outside the main stream art venues. FLAG STOP is searching for alternative venues in which to present the best curated examples of what, why, and how art is becoming relevant today. Each “STOP” will feature art which has been curated with some of the best examples of contemporary art, brought to you by some of the top professional, emerging curators and artists from Southern California. 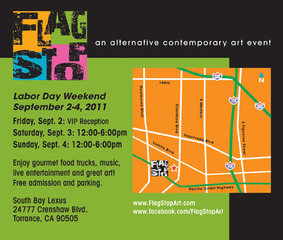 FLAG STOP’s committee is a group of South Bay art supporters, promoters, artists, designers, curators, collectors, local businesses and art enthusiasts, working to establish a new destination opportunity to experience local and international contemporary art. FLAG STOP is creating the opportunity for communities to rethink the possibilities of exhibiting art. The Lexus venue will provide 25,000 sq. feet of indoor exhibit space. Outside, large industrial containers (8’ x 16’) will serve as “micro-galleries” for additional curated exhibitions. This ground-breaking, three day event will include entertainment, food, beverages and special events. Exhibition dates: Labor Day Weekend.